A new type of lizard was discovered in Western Australia by builders who were about to destroy its natural habitat. 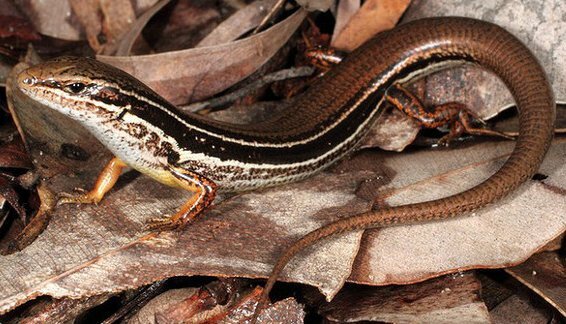 The coastal plains skink (Ctetonus Ora) is just 6 centimeters long and it is already an endangered species. Scientists report that its natural habitat is in the dunes of the Swan Coastal Plain which is south of Perth. The Australian National University stated that the area in which the lizard was discovered is planned for residential housing. However, the building process will probably be frozen as the lizard only lives in sand dunes and can’t adapt to a new habitat. Scott Keogh, biology professor at ANU published a report on which he worked along with Kay. He studied the DNA of other Ctetonus species and reached to the conclusion that the newly found species is smaller than other skinks, has a darker color and one of its obvious characteristics is the white line on its back and side.